Despite its short history, Addis Ababa is one of the most storied and busy cities in Africa. It was founded in 1886 and quickly grew to a population of over three million people, accumulating all kinds of monuments and quirks over the time span. 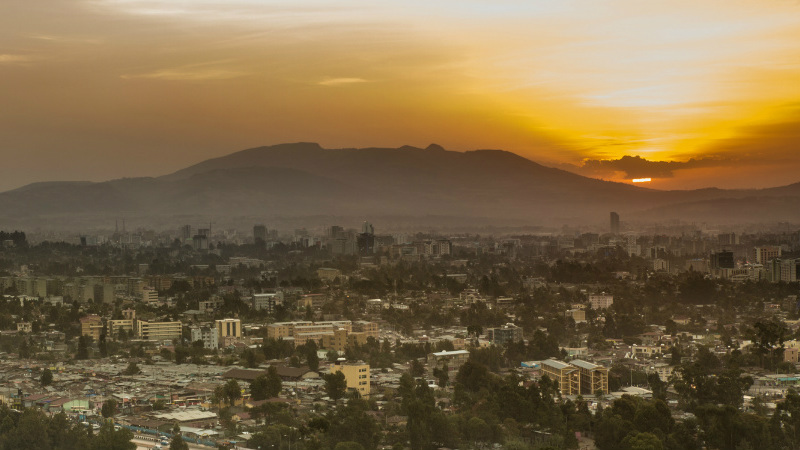 From its beginnings as home to emperor Menelik II, to its crazy traffic, to the remnants of several wars, here are 10 things you probably didn’t know about Addis Ababa, Ethiopia. At a height of 7,726 feet, Addis Ababa has one of the highest elevations for capital cities in the world, and the highest in Africa. This ranks it just behind cities like Bogota, Colombia and Quito, Ecuador. Travelers have been known to experience altitude sickness and shortness of breath after a few days in the city. Unlike other cities in Africa, Addis didn’t start as a traditional small village. Instead, it started of as a military encampment that housed the palace of the emperor Menelik II. The palace was surrounded by his large army of troops. After years went by, people eventually came into the city to settle it. If you visit Addis Ababa, you might wonder what a giant Mexican statue is doing in one of the city’s largest squares. The city built Mexico Square to recognize Mexico’s support of the country during Italy’s occupation. Mexico was the only country in the League of Nations to do so. After seeing the Mexican statue, then this statue of Karl Marx, you might ask yourself if you’re still in Ethiopia. Outside of Addis Ababa University, there is a big statue of Karl Marx, which symbolizes the country’s socialist history. The city was also communist for a time, known as the People’s Democratic Republic of Ethiopia from 1987 to 1991. Think crossing the road is tough where you live? Try crossing the road in Meskel Square. The intersection is one of the craziest in the world and operates without any traffic lights. Despite being close to the equator, the temperatures in Addis never get that hot. Even in the city’s hottest month, the average temperature is only 77F (25C), and the city’s all-time record temperature is only 90F(32C). However, if you travel in other parts of the country, you’ll find one of the hottest places on earth in the Danakil Depression. Unlike other African nations, Addis Ababa and Ethiopia fought off its would be colonizers. During the first Italo-Ethiopian War, people gathered to rally in Addis Ababa behind Emperor Menelik II, then ended up giving the Italians the boot. The emperor’s mausoleum can still be visited in the city. Unfortunately, it seems like the Italians couldn’t get enough of Addis Ababa. They came back to the country in the 1930s and occupied the city for 5 years, where it eventually became the capital of Italian East Africa — a country that stretched all the way to Eritrea. Fortunately, the Italians eventually lost again and Emperor Haile Selassie was able to return to the city. You might think that a city in a country like Ethiopia wouldn’t be diverse, but you would be wrong. There are large several large ethnic groups within the city, such as the Amhara, Gurage, Oromo, and Tigray. There’s also plenty of expats from countries around the world due to the city being home to the United Nations Economic Commission for Africa. Addis Ababa is reputedly home to Africa’s biggest outdoor market, which spans for over a mile in several directions. The market is so big and frenzied that you can easily get lost in the maze of alleys and people. There isn’t that much a typical tourist would want to buy inside, but it’s a great place to wander around and people watch. This article was originally published on March 10, 2016.